Waterways Recovery Group: The Countdown Begins. It is now just four weeks before the volunteers of the Waterways Recovery Group will arrive from all over the United Kingdom and Europe to continue restoring the Trebanos Locks. The two camps will last a week each and each will be led by a different WRG leader. Both leaders took the opportunity to visit the work site today (June 14th). We thank George Rogers and Bob Crow for making the long journeys from Derby and Oxford to spend a few hours on the Swansea Canal. Their dedication is much appreciated. 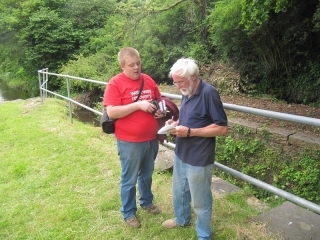 They were joined at the locks by John York, the Chief Engineer of the the Canal and River Trust for Wales and the South West. We thanks him too for coming all the way from Gloucester. 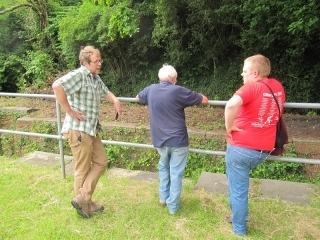 They discussed the work that can be done on the two locks. The photo above shows them in front of the lower lock chamber which will be emptied to allow coping stones and other debris to be removed from it. From left to right are John York, Bob Crow and George Rogers. 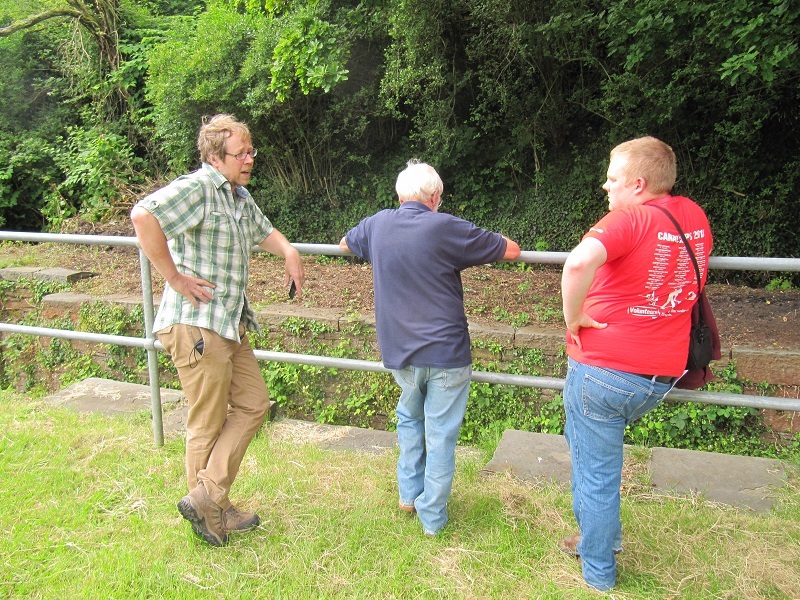 Here Bob and George are seen discussing the results of the Trebanos Locks silt sample analysis done by the University Of Swansea which will determine how the silt from the chamber can be disposed of. Previous postOur New Canoes Arrive: 11.6.14 Next postButterflies and Dragonflies Walk: June 21st.